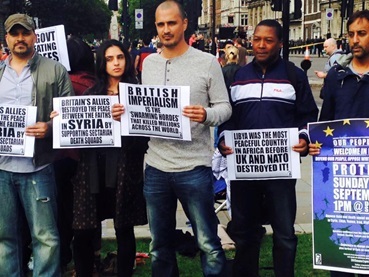 Following the massive 200,000 demonstration to declare “refugees welcome here” of Saturday, September 12, 2015, Malcolm X Movement organised a protest meeting in Parliament square next to the Winston Churchill statue. A megaphone did the rounds as each activist shared ideas as to what is the cause of the refuges crisis. The strength of the gathering was the diversity and militancy of those present, for example a young woman who recently came from Gaza spoke and related how the actions of western powers continues to undermines the aims of the Palestinian nation to achieve self-determination. The STOPFIIA representative explained that the source of the crisis is foreign intervention which has caused instability and the mass movement of the people fleeing conflict. He explained that Britain plays a key role in producing ideological justifications for intervention which have either no or a weak legal basis such as 'responsibility to protect' and 'failed and failing states leading to ungovernable spaces which are then filled by terrorist organisations'. He mentioned the extent to which particularly American forces had infiltrated African military through their pivot to Africa in the form of Africa Command(AfriCom). Taking north Africa and the Sahel as an example he explained that whilst for the last ten years the Americans were supposedly training African government forces on 'anti terrorist operations' suddenly US troops were in places which had no so called 'terrorist activity' and are now being described as "a swamp filled with terrorist activity". These were coupled with outlandish claims that some of these forces came all the way from Afghanistan. Rather because Africa is assuming greater strategic, economic and political significance on the international scene there is great inter imperialist rivalry for control and influence in Africa, a new scramble. China for example has now surpassed the Americans as the biggest economic player whilst the Americans have massively increased their military presence engaging in more the 500 military exercises in 2014 alone. This creates many dangers for the people, one of them being greater number of refugees, particularly, in the states which have had their governments and infrastructures bombed out of existence. This has created a vacuum in which competing factions sponsored by the west compete for hegemony. As the imperialists have created this crisis for the people they must fully accept responsibility for it and provide refuge for those fleeing areas of conflict and persecution. They must and will be made by the peoples to put an end to this reckless intervention. Another key aspect is the thoroughly and openly racist response of the British state and its representatives to the refugee crisis. David Cameron went as far as echoing the racism of Margaret Thatcher with his use of the word “swamp”. He was directly answered by one of the protesters on the huge demo the day before who carried a placard stating “86% of refugees remain in developing countries. We are not being swamped”. Following the discussion the protesters held up posters and took group photos. Those who felt so inclined made a brief video statement which acts as a good summary of the discussion. See these statements below. 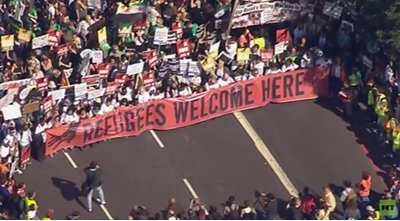 More than 100,000 people took part in a national march and rally in central London on Saturday, September 12, the focus of a national day of action to declare “Refugees Welcome Here”. 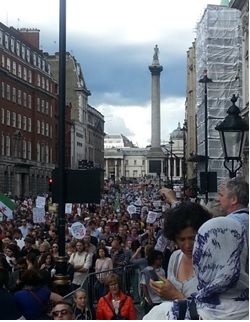 The demonstration in London and wider day of action, which included events in Edinburgh, Glasgow, Cardiff, Belfast, Newcastle and many other cities, was called by Stop the War Coalition, Solidarity With Refugees, Stand up to Racism, Barac, Migrant Rights Network, People's Assembly, War on Want, Movement Against Xenophobia, Love Music Hate Racism and Black Out London. It was a huge, diverse and youthful energetic march and rally organised to send a loud and clear message that “Refugees are Welcome in Britain” and to protest against the Cameron government’s inhuman stance. 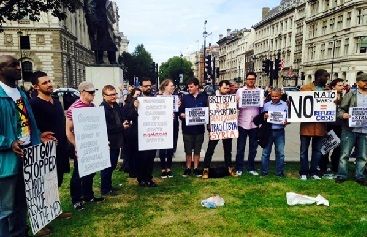 The organisers called the event “in response to various reports of refugees fleeing war, persecution, torture and poverty losing their lives or struggling to find a safe haven” and to protest against the “disgraceful” government response to the crisis. Starting in Marble Arch at midday headed by a number of refugees, amongst the banners on the demonstration were: Refugees welcome here; 86% of refugees stay in developing countries. We are not being swarmed; Be human – Solidarity with refugees; Human rights are not conditional; No one is illegal; Jews welcome refugees; Don’t forget the Afghans, Iraqis and Eritreans; Don’t accept any narratives against human rights; Let them in; Refugees are human beings; Gays support refugees of terror; 20,000, are you joking? Solidarity with refugees; Our silence kills them; Refugees in, Tories out; Refugees' lives matter; Don’t bomb Syria; End the drowning; EU let them through; We are all equal; No life is illegal; No human is illegal; Take the wealth of the 1%, fight for 100s of homes and services for all; Reject politics of fear. The action was also aimed in opposition to the manipulation of the crisis as a pretext for further military intervention in Syria. “Surely our objective ought to be to find peaceful solutions to the problems of this world, to spend our resources on helping people, not hindering people and to try and bring about that world of decency, human rights and justice,” Jeremy Corbyn said. Other speakers included director of Liberty Shami Chakrabarti, musician Billy Bragg, Liberal Democrat leader Tim Farron and Green Party leader Natalie Bennett.